AUSTIN, Texas – Jan. 3, 2011 – Freescale Semiconductor introduces the i.MX 6 series of quad-, dual- and single-core applications processors designed to deliver outstanding performance and scalability to manufacturers targeting the hottest selling smart mobile, automotive infotainment and embedded device categories. Integrating one, two or four ARM® Cortex™-A9 cores running at up to 1.2 GHz each, the i.MX 6 series delivers up to five times the performance of Freescale’s current generation of applications processors. This performance provides additional headroom for unbounded user experiences in next-generation tablets, eReaders, smartphones, automotive infotainment systems and other exciting consumer and automotive products. Potential applications include mobile devices featuring 3D video playback, desktop-quality gaming, augmented reality applications and content creation capabilities – all delivered in ultra-sleek form factors and with significant battery life advantages over many of today’s most popular mobile devices. Check out the full Freescale i.MX6 Press Release. They will start delivery of samples end of 2011, so you can expect products to be delivered with this chip sometimes in 2012, a bit before products based on Cortex A15 / Mali T-604 are released. 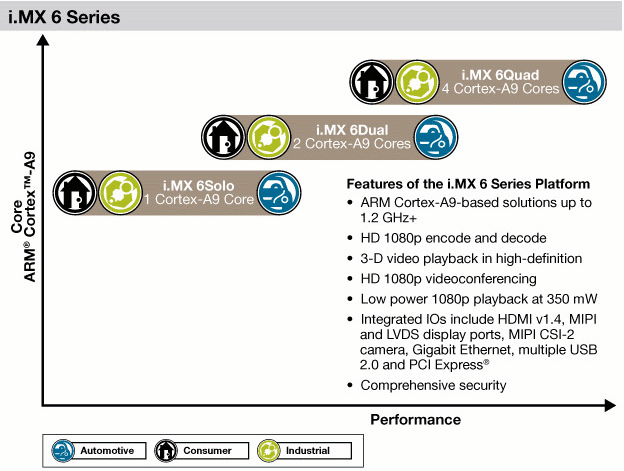 You may consult Freescale i.MX6 Series Fact Sheet for more details. We do not know much about the GPU, however you can notice that at 200 Million Triangles per second, the GPU is over twice as fast as NVidia Tegra 2 (90MT/s) and over 5 times faster than Mali 400 (30 Mt/s). 5 times is exactly the performance improvement announced earlier for Mali T-604… So i.MX6 Series might be one of the first to embed the new ARM GPU Mali T-604. i.MX6 Series will apparently use i.MXS development kit that was also used for other i.MX series such as i.MX5 Series.